If you have any questions about the RADIANT information page below please contact us. RADIANT was previously called project/yacht name Aidre. This 52 m (171 ft) luxury yacht was developed by Amels Yachts (Of The Damen Shipyard Group) in 2004. Motor Yacht RADIANT is a notable superyacht. The naval architecture office responsible for this yacht's drawings on this ship is Amels and Terence Disdale Design. Her initial interior design and styling was the brain child of Terence Disdale Design. Luxury yacht RADIANT is a handsome yacht that is able to accommodate up to 12 people on board and has approximately 13 professional crew. Motor yacht RADIANT was designed by Terence Disdale who has redefined his classic style. The yacht features large areas of free deck space allowing for a barbecue, Spa Pool, and dining for ten on the large afterdeck. The yachts interior has subtle colour schemes complimenting the warmer climates she cruises in. M/Y RADIANT has sister ships named TIGRE D'OR, KISS THE SKY and DEJA TOO. Amels was the naval architect firm involved in the professional vessel composition for RADIANT. Also the company Amels and Terence Disdale Design skillfully collaborated on this project. Interior designer Terence Disdale Design was responsible for the overall interior ambience. In 2004 she was formally launched to triumph in Makkum and post sea trials and detailing was then passed on to the new owner. Amels Yachts (Of The Damen Shipyard Group) completed their new build motor yacht in the Netherlands. The hull was crafted from steel. The motor yacht main superstructure is fabricated for the most part from aluminium. With a beam of 9 metres or 29.5 ft RADIANT has spacious interior. She has a deep draught of 3.1m (10.2ft). She had refit maintenance and modification completed in 2007. The KTA-38-M2 engine installed in the motor yacht is built by CUMMINS. She is driven by twin screw propellers. The engine of the ship produces 1200 horse power (or 896 kilowatts). She is equiped with 2 engines. The combined output for the yacht is therefore 2400 HP or 1766 KW. Bestowing chambers for a maximum of 12 visiting passengers staying on board, the RADIANT accommodates everyone luxuriously. Normally the vessel utilises around 13 professional crew members to maintain and sail. Range in nautical Miles is 5000 at a speed of 13 knots. 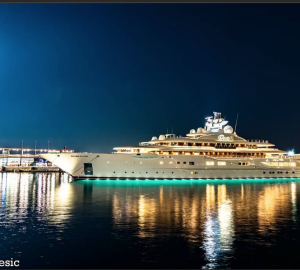 Heinen & Hopman is the company that made the air conditioning system in this yacht. RADIANT features a teak deck. The luxury yacht RADIANT displayed on this page is merely informational and she is not necessarily available for yacht charter or for sale, nor is she represented or marketed in anyway by CharterWorld. This web page and the superyacht information contained herein is not contractual. All yacht specifications and informations are displayed in good faith but CharterWorld does not warrant or assume any legal liability or responsibility for the current accuracy, completeness, validity, or usefulness of any superyacht information and/or images displayed. All boat information is subject to change without prior notice and may not be current.